The guinea pig is a Jekyll and Hyde creature. It is the cuddly domestic pet that owes its portly form to hundreds of years of breeding for the table in the Andean mountains. But it's also the unsung hero of our laboratories. 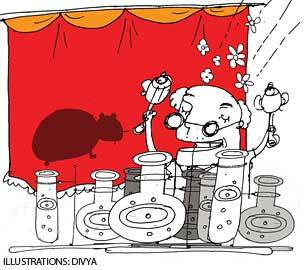 At least 25 Nobel Prize winners owe their laurel to the guinea pig, but the rodent has never quite got the credit it deserves. The unfortunate creature is the lead character in Jim Endersby's A Guinea Pig's History of Biology. The guinea pig became a favourite of vivisectors from the 18th century onwards and helped establish the germ theory of disease. Later, it featured in breeding programmes which helped make the final links between genetics and evolutionary theory. Endersby's story has other protagonists as well.We meet the fruit fly, beloved of early 20th century geneticists whose labs were full of rotting bananas and clouds of tiny insects. We encounter the quagga, a now-extinct relative of horses and zebras that played an important role in the 1800s in understanding the mechanisms of genetic inheritance. There are bacteriophages--virus which preys on bacteria and is crucial to research on dna --and the weed, arabidopsis, which became the first plant to have its genome unravelled. We also meet the zebra fish whose transparent eggs and larvae allow scientists to understand how a network of blood vessels blooms. The book is replete with neat accounts of the big daddies of biology--Darwin, Mendel, J B S Haldane, Watson and Crick. There is the introvert botanist Sewall Wright, who would lecture with a misbehaving guinea pig clasped under his armpit. He used the guinea pig as blackboard eraser. The zoologist William Castle at Harvard in 1910 had a lab which housed 400 rabbits, 700 guinea pigs, 500 mice, 1,000 rats, 400 pigeons, eight dogs and innumerable frogs. But his effort to understand the effects of sustained inbreeding led him to the fly. The fly pioneers analyzed 20 million insects to draw up the first chromosome maps. The stories are dotted with interesting tidbits of social history. The abolition of a tax on glass in 1845 led to an explosion in building greenhouses and a fashion for growing exotic plants Darwin found much to feed his evolutionary thinking in the pollination of orchids and the pertinacity of the passionflower. The fruit fly found its way to labs in the US only because it hitched a ride to the Caribbean from eastern Asia in the 16th century along with its favourite food, the banana, imported as cheap food for slaves. This is a fascinating book. But Endersby makes us greedy. We yearn for stories about other humble creatures of the lab the sea-urchin, the bacterium Escherichia coli, or even the mouse, which accounts for the vast majority of animal experiments.